In the August Gallery competition my painting “Some Gave All and the Rest Gave a Whole Heck of a Lot” won Best of Show. I was so excited as that was my first Best of Show win. This is a 14″ x 11″ (matted to 20″ x 16″) watercolor painting of MY uniform with my top three medals (Joint Service Commendation Medal, Navy Achievement Medal, and Meritorious Unit Commendation Medal). For those who don’t know I spent 17 years in the U.S. Navy. So, I entered the paintings from my last post into competition yesterday and I’m happy to report that my “Golden Koi” painting won 1st Place! I can hardly believe it is already September and my last post was in January. Time sure has flown by. My apologies for being MIA. I’ve had some personal things going on that have really taken up a lot of my time over these past 7 months. Do not worry though, I have still been creating art! I’ve also gotten really involved with a couple of Urban Sketching groups down in San Diego, but I’ll save that for another day. 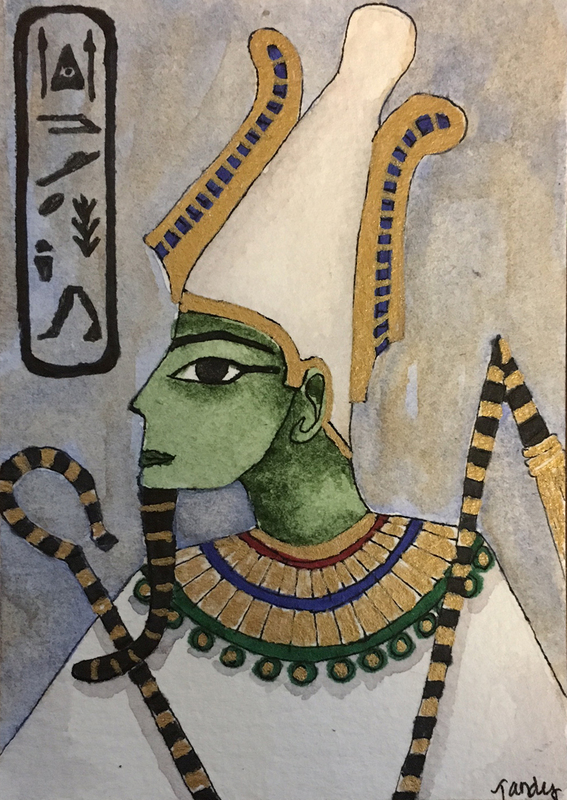 The third watercolor painting I am sharing I also plan to enter into an art competition in a miniature category; it measures 7″ x 5″. It is titled “Motel.” It is my interpretation of an old motel on Highway 74 in Homeland. 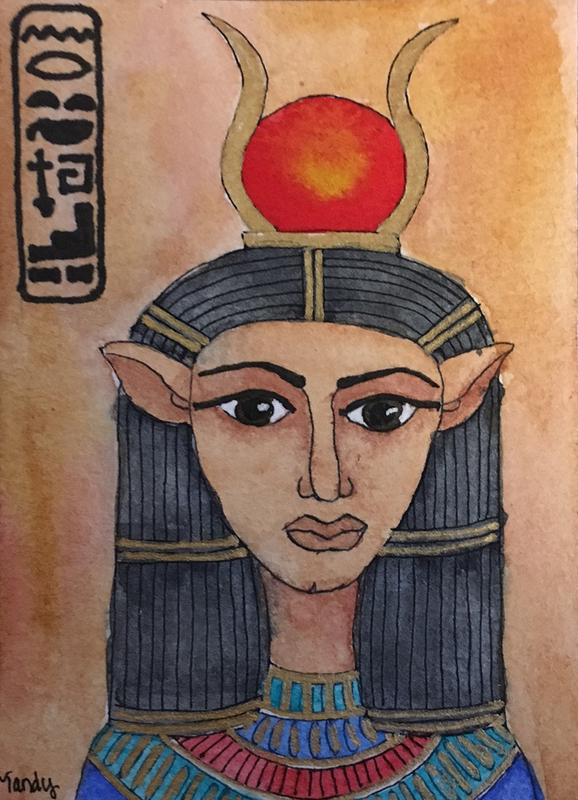 The fourth watercolor painting (10″ x 8″) is also going to be entered in a competition. It is titled “Yellow Koi” and was painted from a photo I took of the koi pond at Balboa Park in San Diego. 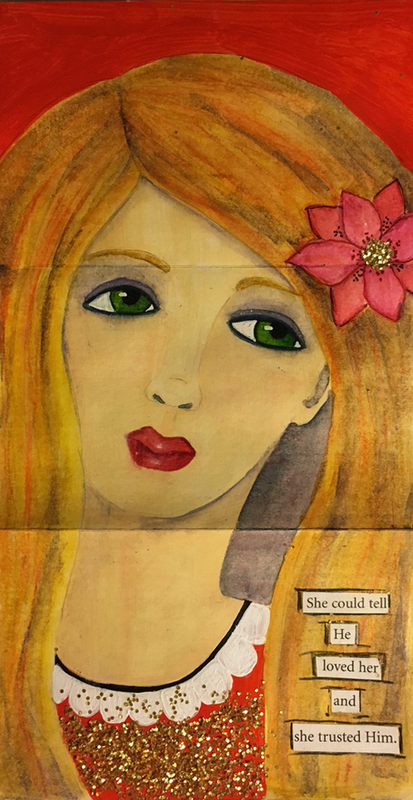 This last mixed-media painting (5″ x 7″) was done for a friend of mine. She loves dragons and asked me if I would paint one for her. I finally got around to painting it yesterday afternoon. I’ll be giving it to her a week from this Tuesday (hopefully). I’d love to hear what you think. Thank you so much for stopping by. Have a Blessed day! I’m so sorry I haven’t posted in a while. I hope everyone had a wonderful Christmas. I thought I’d do a quick little post to show you some of the things I’ve made while I’ve been MIA. 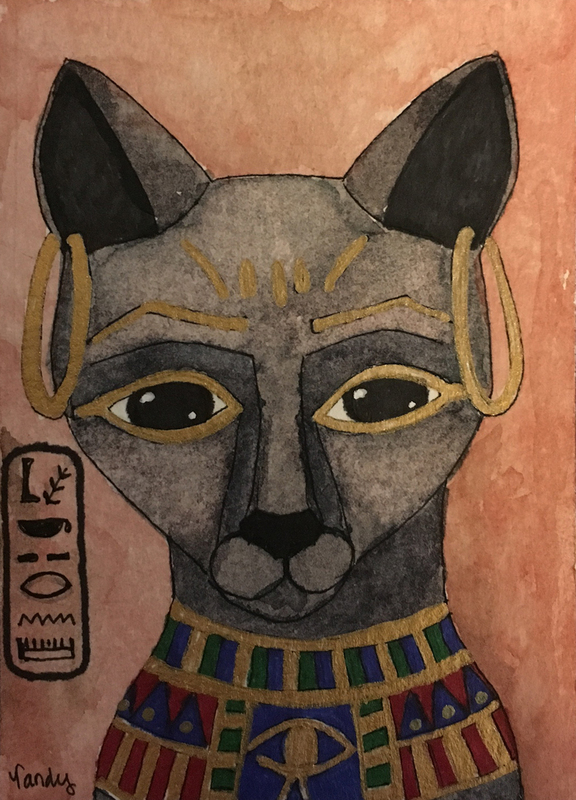 I’ve been participating in a Moley Group Swap on ATCs For All. If you are unfamiliar with a Moley Group Swap it is a group of about 10-12 artists and we all buy a Japanese Moleskine Sketchbook (Accordion Style) and each artist chooses a theme for their journal. We then mail our journals off to each other to complete a 3-page spread in each book. Here are the pages I have done so far. This one I just finished yesterday for Waffle’s book. Her theme was Suzi Blu Style Pretty Girls. This next one I did in Bluesky’s book. Her theme was In the Style of Cori Dantini. This one was done for TheWeaversHand. Her theme was Altered Magazine Pages. The jellyfish were cut out from a magazine. I embellished them with gel pens and painted the background. 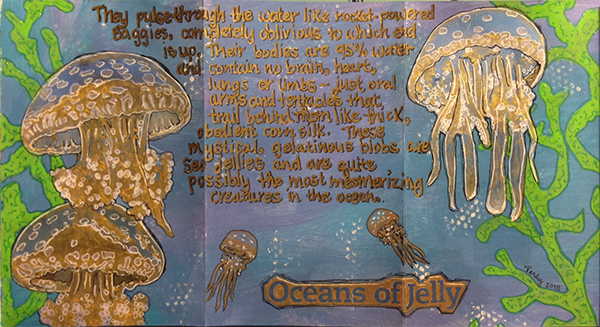 I also wrote some information about jellyfish on the page. This last one was for my book. My theme is Hometown Landmarks. 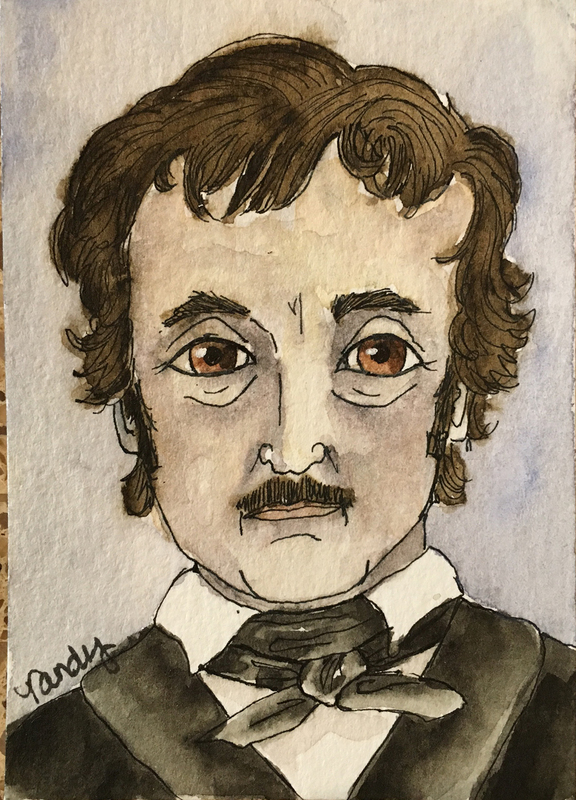 I also participated in an In Memory of Edgar Allan Poe and an Egyptian Gods & Goddesses ATC swaps on Illustrated ATCs. These are the ATCs I made. Let me know what you think. I’d love to hear have your feedback. Have a blessed week! The other day I shared a picture of what was on my desk on Facebook and Instagram. I have posted it above. 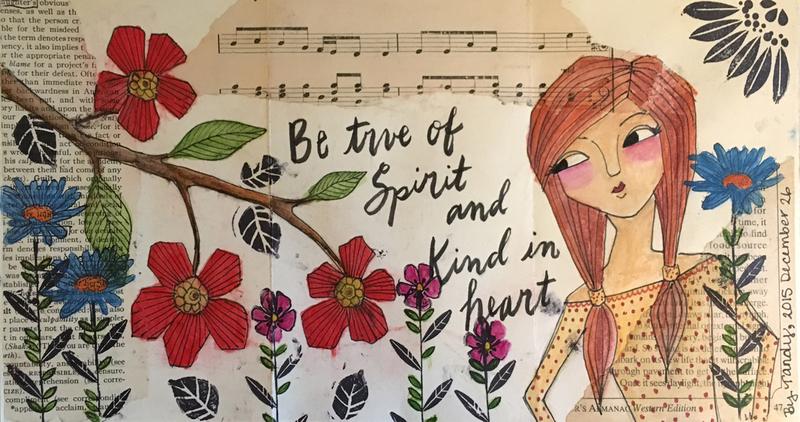 I always think it is fun to see what other people are working on and what art supplies they like to use. What is on your desk? I’d love to see a picture if you can post a link! Also, what are some of your favorite art supplies? My thoughts on art supplies (if you want to know my take on an art supply that I haven’t listed, please feel free to ask). You don’t have to agree with my opinions. My opinions are derived from actual use of the products I mention here. I am not getting paid by any of these companies to give my opinion. Watercolor Paper: The Strathmore and Canson watercolor paper pads are okay for making ATCs (I use Canson 140lb Cold-Pressed for my ATCs). If you were making full-size paintings (especially if you plan to sell them), I would recommend the following papers: Arches, Kilimanjaro, and Fabriano Artistico in either 140 lb (300gms) or 300 lb. 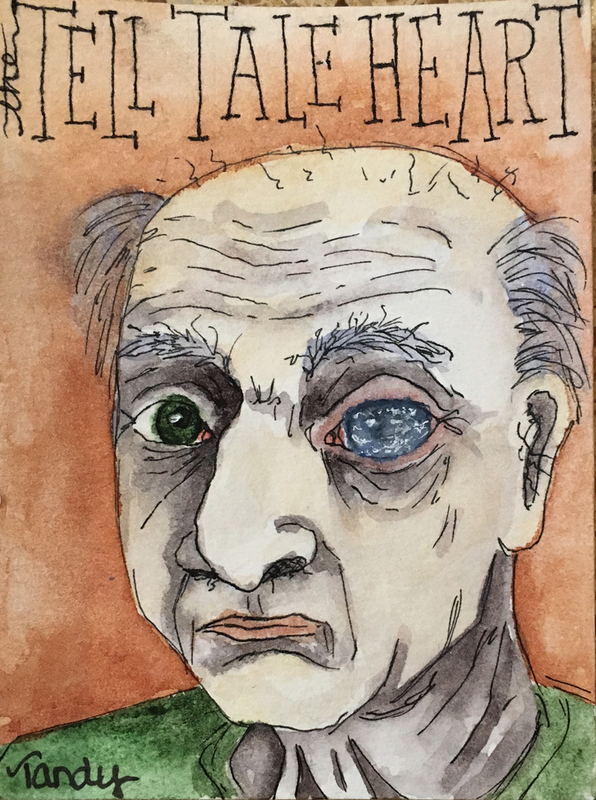 Watercolor Paint: You truly get what you pay for! There is more pigment and less filler in professional grade watercolor paint vice student grade, which have more filler and less pigment. Any professional artist grade brand of watercolor paint should be fine. Here are some of my favorite brands: Daniel Smith, Holbein, Sennelier, Schminke, M. Graham & Co., Winsor & Newton (not Cottman-that is it’s student-grade line and contains more filler and less pigment), Grumbacher (not Academy-that is it’s student-grade line), and Lukas. 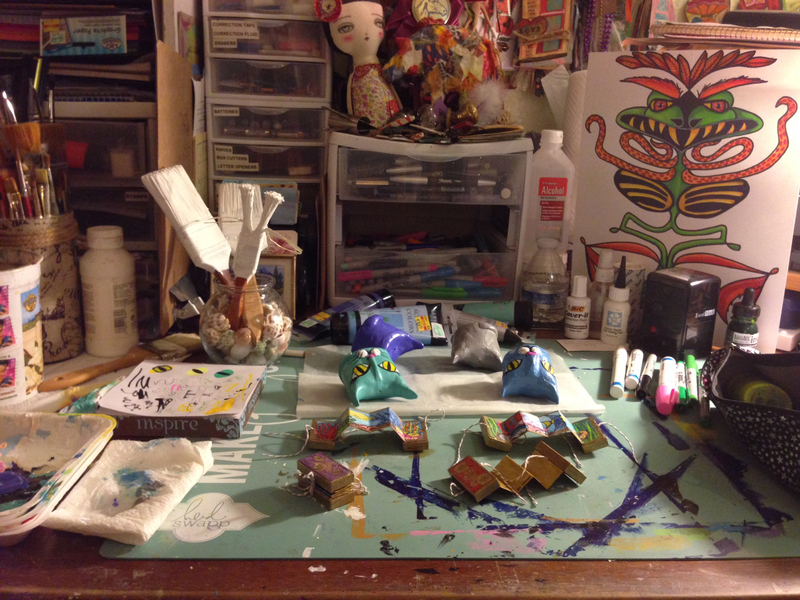 Acrylic Paint: I used to use craft paint and student grade paint until I tried professional grade. For Acrylics I typically use Golden and Liquitex (not Liquitex Basic as that is student-grade). I also use both Golden and Liquitex acrylic mediums. Watercolor Paint Brushes: Escoda Prado Sintetico (any brush by this brand, but I exclusively use the No. 8 Round), Princeton Neptune (again any brush by this brand, but I use the No. 8 Round, No. 6 Quill, and ¾ Dagger), Simply Simmons (No.s 2, 4 and 6 Rounds, and ½” Flat), Grumbacher Goldenedge (1-1/2” Wash), Silver Black Velvet (1” Flat), Winsor & Newton California (3/4” No. 2 Ox Hair), Richeson Professional-Steve Quiller (No. 10 Round), Ebony Splendor Rigger Creative Mark (No.s 0 and 3), Cheap Joe’s Fritch Scrubber (No.s 4, 6, and 16), and a really old size 14-16 Round that I have no idea what brand it is because all of the paint has come off the handle and it is the wood underneath is exposed. Acrylic Paint Brushes: These are not as important to me as my watercolor brushes. I mostly use flats and rounds. Some of the brands I have are: Simply Simmons, Royal Soft-Grip, Princeton Art & Brush Co., Loew-Cornell, Robert Simmons Sapphire, and Protégé. Alcohol-Based Markers: I like Copic Sketch markers and Prismacolor Premier markers equally. I have and use both. I have also tried Spectrum Noir markers and the newer Touch markers by Shin Han Art, but I still prefer the Copics and Prismacolors. Other Markers: I use the Stabilo Point 88 fine 0.4 markers; these are water-based and can be used to shade by putting a wet brush to your ink line. 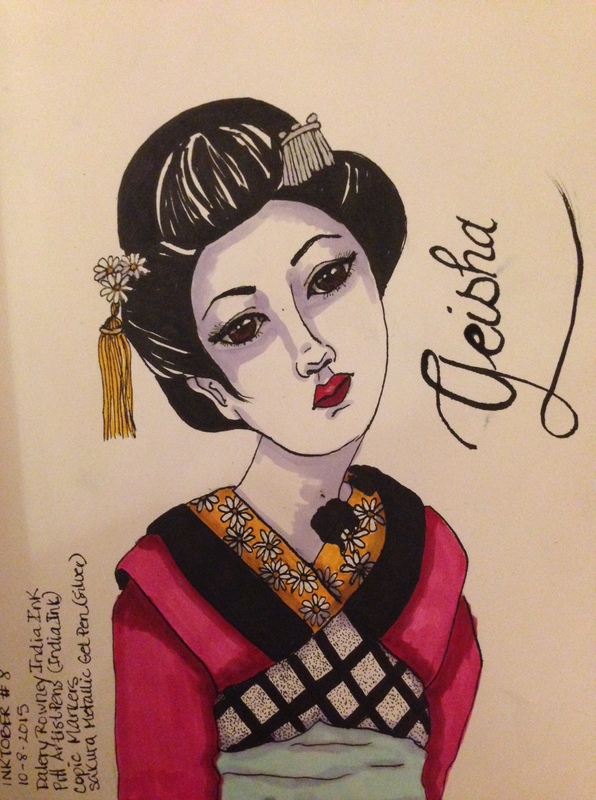 I also use the Faber-Castell Pitt Artist pens, which actually contain India Ink; they are permanent once dry. Another good choice is the Staedtler Triplus Fineliner pens. Fine Lines Pen: I exclusively use the Rotring Rapidograph .10. It is not cheap, but also offers replacement ink cartridges and nibs. I especially like that the nib is metal and not a felt tip. Outlining Pens: Copic Multiners, Copic Multiliner SPs (refillable and replacement nibs available), Pitt Artist Pens, Sakura Micron Pigma Pens, and Prismacolor Premier Illustration Markers, and Staedtler Pigment Liner Fineliner pens. The only problem is that all of these are felt tip and I have a heavy hand when it comes to drawing so none of them last me very long and the felt tips get destroyed quickly! Calligraphy and Writing Pens: Tombow Calligraphy Pen (WS-BH), Brush Pen No. 22 (I don’t know the brand because it is written in Japanese (it resembles a water-brush except it is filled with black ink), Wink of Luna and Wink of Stella brush pens, Zig Art & Graphic Twin pen (brush tip end), Copic Sketch Markers (brush tip end), and Lamy Safari Fountain Pen. Gel Pens: Sakura Gelly Roll (metallic-gold & silver, moonlight meteor-clear glitter, and white), Sakura Glaze, and Sakura Soufflé). Paint Pens: Molotow One4All Acrylic Paint Pens and Sharpie Water-Based Paint Pens. Fountain Pen Ink: Noodler’s Inks (favorite: Heart of Darkness-bulletproof black ink). Dip Pen Ink: Dr. Ph. Marten’s Bombay India Inks and Higgin’s India Ink. Mechanical Pencils: Staedtler (size 0.5 with H2 lead and 0.7 with HB lead), KOH-I-NOOR Rapidomatic (size 0.5 with H2 lead), and Artisto DK2 (size 0.5 with HB lead). Wood Pencils: Staedtler Mars Lumograph (drawing set), Caran d’Ache Black Wood 499 HB (a big fat pencil great for transfering graphite lines onto paper and linoleum), Stabilo All Aquarellable (Black and White), Prismacolor Ebony, and water-soluble graphite (any brand). Watercolor Pencils: Prismacolor Premier, Derwent Inktense, and Derwent Graphitint. Oil Pastels: Sennelier Artist Oil Pastels. Water-Soluble Pastels: Caran d’ache Neocolor IIs (water-soluble wax pastels) and Portfolio by Crayola (water-soluble oil pastels). Well I’m already into week two of #inktober. It is going by so fast. I have seven new drawings to share with you today. 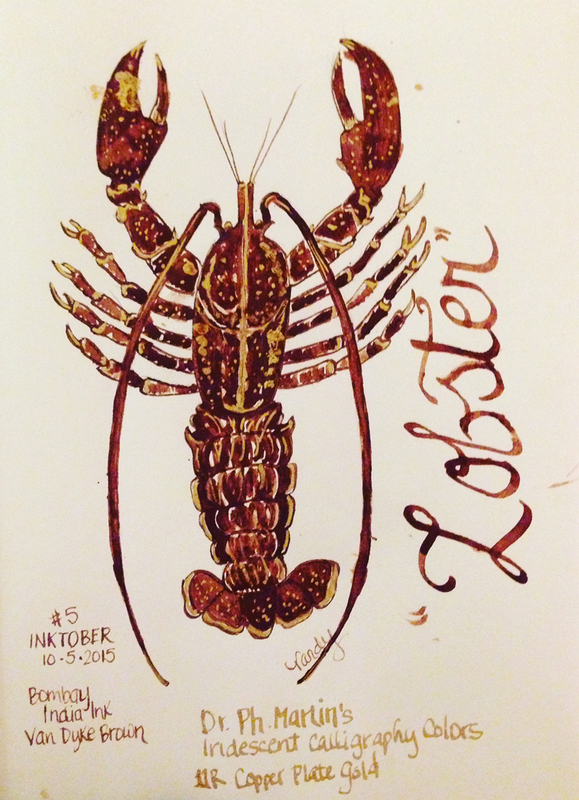 Inktober Day 5: For Day 5 I used Dr. Ph Marten’s Bombay India Ink in Van Dyke Brown and then I used Dr. Marten’s Iridescent Calligraphy Colors in Copper Plate Gold for the accents. I used a dip pen and found that I was having an extremely hard time regulating the brown ink with particular nib I used. The ink was bleeding everywhere and through the paper too. Overall I guess it came out okay, but I was pretty frustrated by the time I finished it. Inktober Day 6: For Day 6 I used Higgins Calligraphy Ink in black, although I personally think it looks more like a dark gray, and a dip pen. 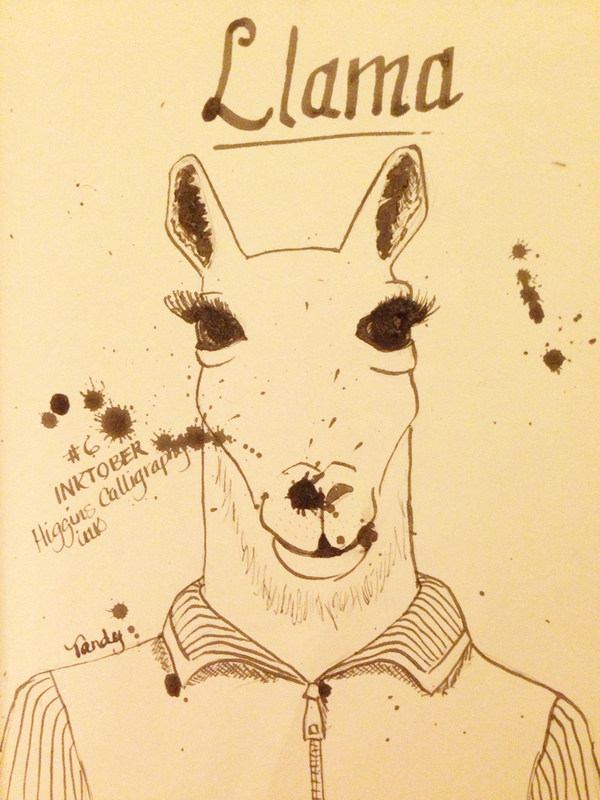 This drawing went pretty well until I accidentally dipped my pen to far into the jar of ink and a big old splotch landed right on my llamas nose! I was so disgusted so I decided to splash on some more ink. In the end I suppose the ink splotches worked out fine. 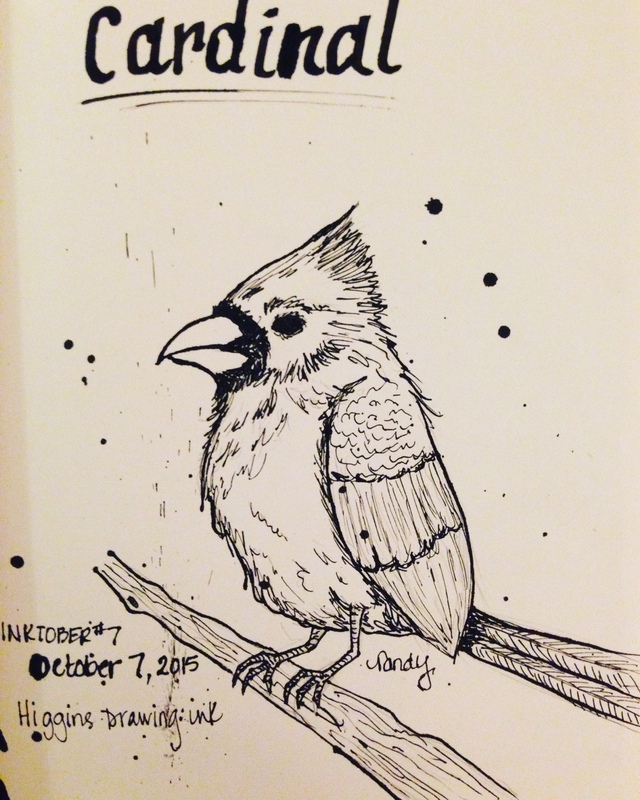 Inktober Day 7: For Day 7 I used Higgins Drawing Ink (waterproof) in Black. The Higgins drawing ink “black” is much darker than their calligraphy ink “black”. I used a dip pen again. 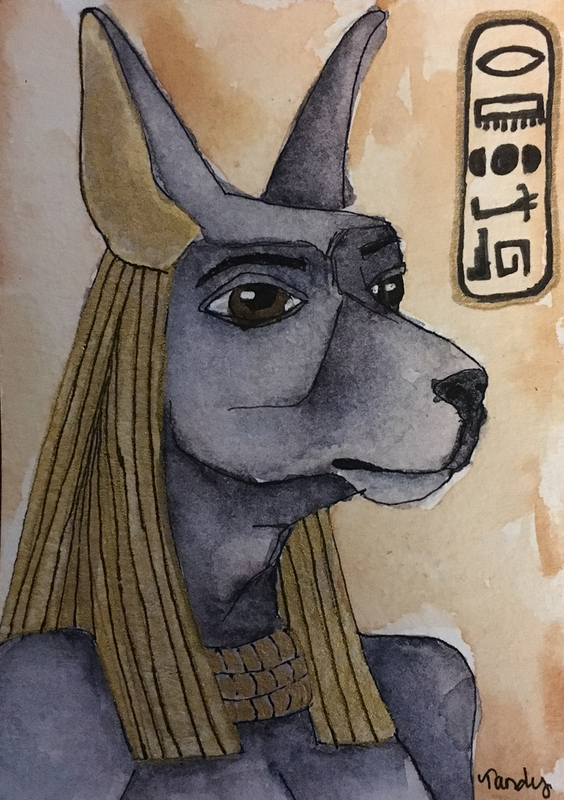 Overall the ink and pen seemed to cooperate with me and I am relatively happy with the results. 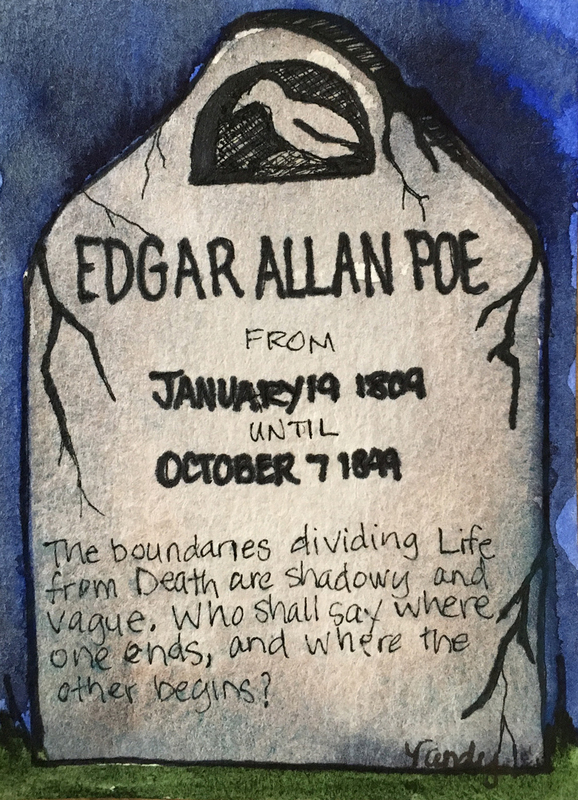 When I was writing my info on the drawing the pen kind of flicked ink upward (where it looks like little black vertical lines) so I decided to also add a few ink splatters. 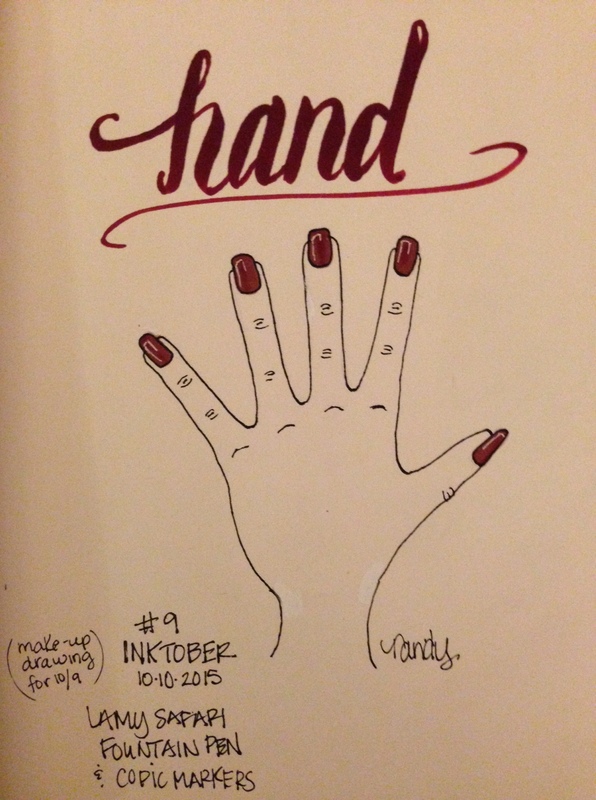 Inktober Day 9: Day 9 was actually done a day later as I was overwhelmed with projects on Day 9. Since I was trying to catch up I used my Lamy Safari fountain pen instead of dip pen. 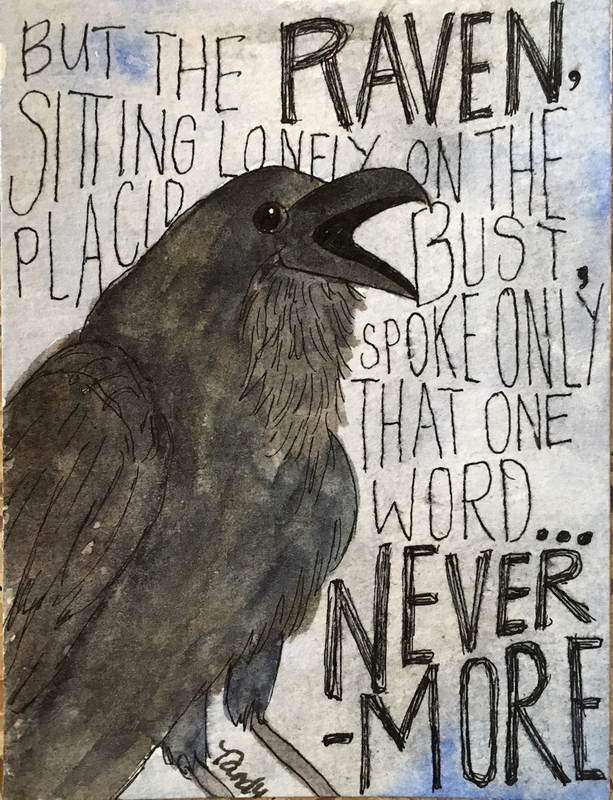 My pen is filled with Noodler’s Heart of Darkness ink. I used Copic markers for the fingernails and the word “hand”. I also used a Sakura white gel pen to add highlights to the fingernails. I’m not very good at drawing hands so I wanted to try out this new techniques I saw for drawing hands. Hey, at least it looks like a hand now. LOL. 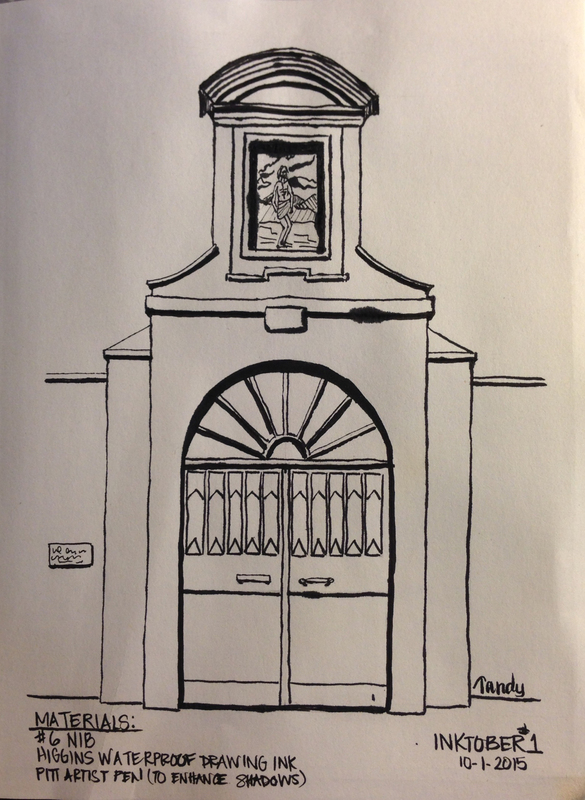 Inktober Day 10: For Day 10 I used Liquitex Acrylic Ink in Sap Green with a dip pen. 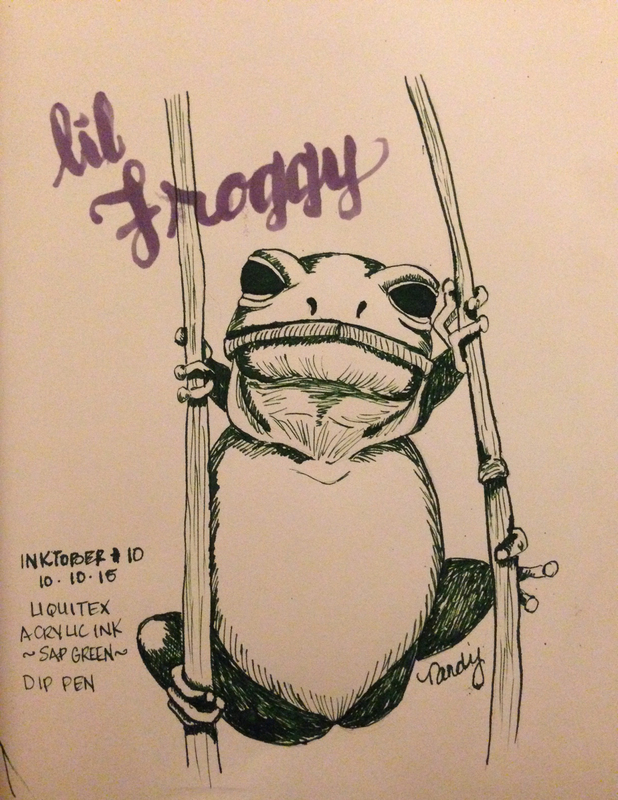 The words “lil Froggy” were written with a Copic marker (brush tip). This lil froggy was fun to draw. I felt comfortable drawing with the dip pen on this one and I’m happy with how this lil froggy came out. 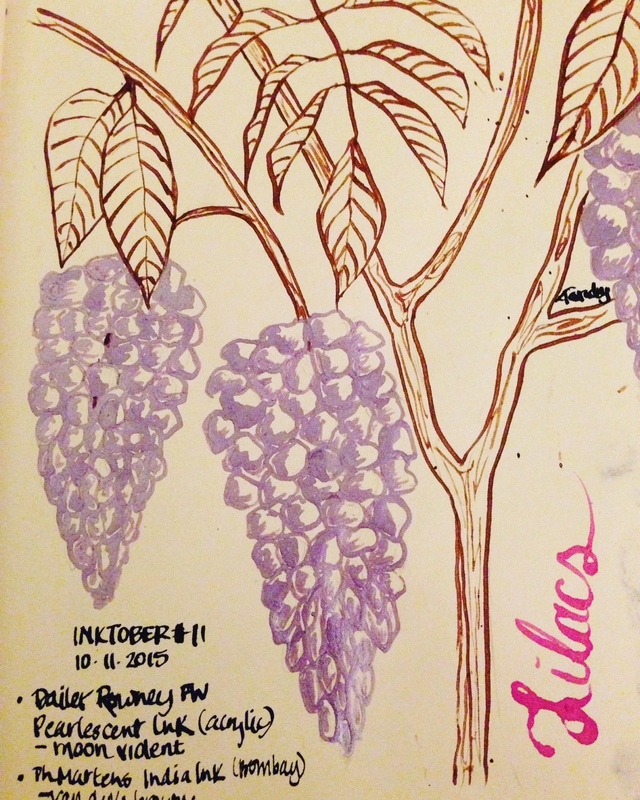 Inktober Day 11: For Day 11 I used Daler-Rowney FW Pearlescent Acrylic Ink in Moon Violet and Dr. Ph. 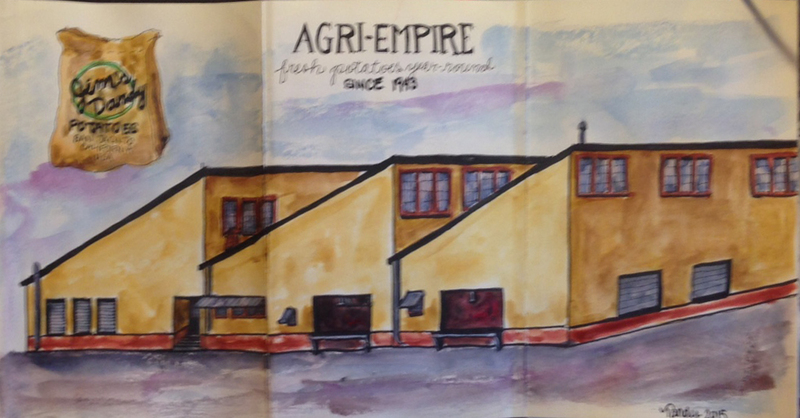 Marten’s Bombay India Ink in Van Dyke Brown. 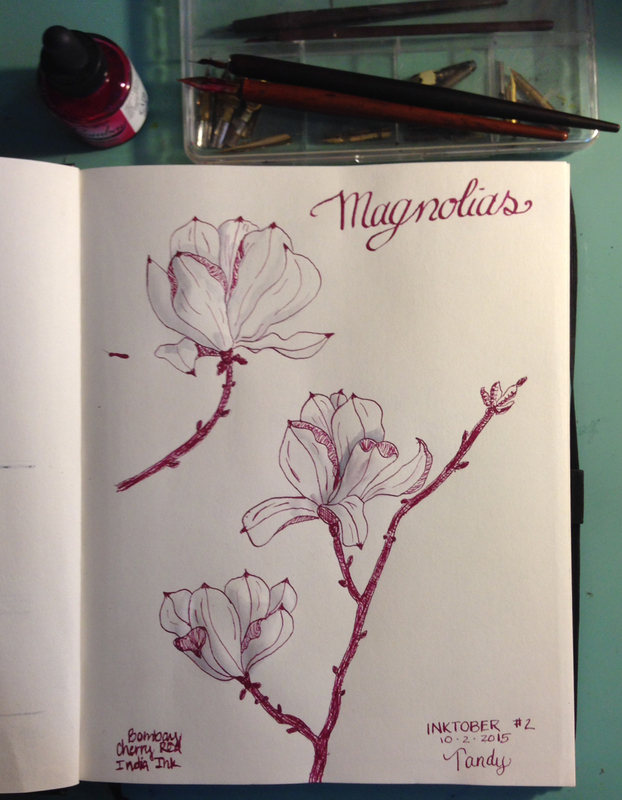 I was NOT happy with with how the FW Pearlescent ink behaved with the dip pen. I don’t think I will use those pearlescent inks with dip pens again. Using that ink was actually a bit of a nightmare and made for an unpleasant drawing experience. Well, that is it for week two of Inktober. I’ll be back later to show you what I draw this week! Happy drawing! Every October, artists all over the world take on the #inktober drawing challenge by doing one ink drawing a day the entire month. 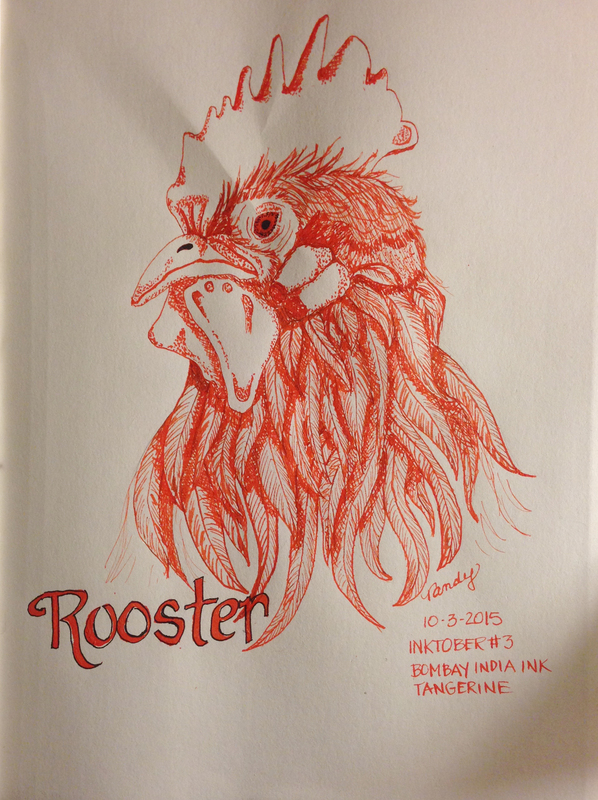 Jake Parker created Inktober in 2009 as a challenge to improve his inking skills and develop positive drawing habits. It has since grown into a worldwide endeavor with thousands of artists taking on the challenge every year. The logo above is linked to the Inktober web page where you can read the rules and other information. I am participating in Inktober for the first time. You can use any kind of ink pen, but I want to learn how to use a Dip Pen for drawing. So I will be challenging myself to do all 31 drawings for Inktober using a Dip Pen. I have a whole box of different inks and a lot of pen nibs so I plan to have some fun with this challenge. 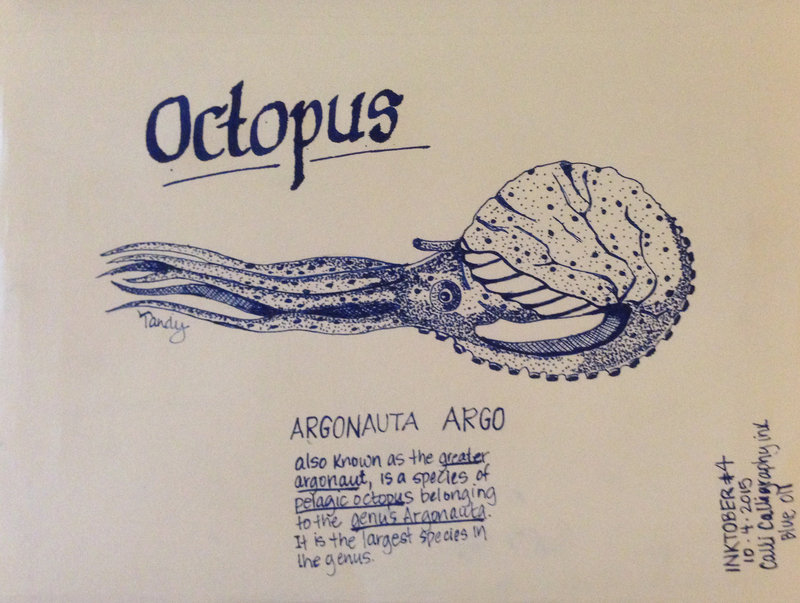 I will post my Inktober drawings on a weekly basis (so you’ll see a weeks worth of drawings in one post). This was my first time drawing with a Dip Pen. You might notice the there are some spots where the pen really bled, this was due to my applying too much pressure with the nib. The nib separates and widens when pressure is applied. This is definitely going to be a learning experience. I seemed to have better control of the Dip Pen on my second drawing. I also used a small amount of Daniel Smith’s Shadow Violet watercolor paint on the flower petals to create some shadows. Day three’s drawing was a lot of fun, especially with the Tangerine ink! Again I felt I had good control over the nib of the pen. This one was also fun to draw. Again, I felt like I had good control of the pen nib. All images and content © 2014-2016 Tracy A. Anderson (unless otherwise stated). All rights reserved. Copying or using any of the images and/or content on this blog without my express written permission is a direct violation of U.S. Copyright law.